تورم به گونه‌های متفاوت رفاه اقتصادی را خدشه‌دار و یا به عبارت دیگر زیان رفاهی برای جامعه ایحاد می‌نماید. مطالعات متعدد نشان داده است که رابطه مثبت و معناداری بین سیاست‌های پولی و تورم به ویژه در کشورهای در حال توسعه و از جمله ایران وجود دارد و بحث در هزینه‌های رفاهی تورم و برآورد آن به سیاست‌گذاران کشور، به ویژه مقامات پولی کمک می‌کند تا اثرات رفاهی سیاست‌های خود را بدانند و بر اساس آن تصمیم‌گیری نمایند. 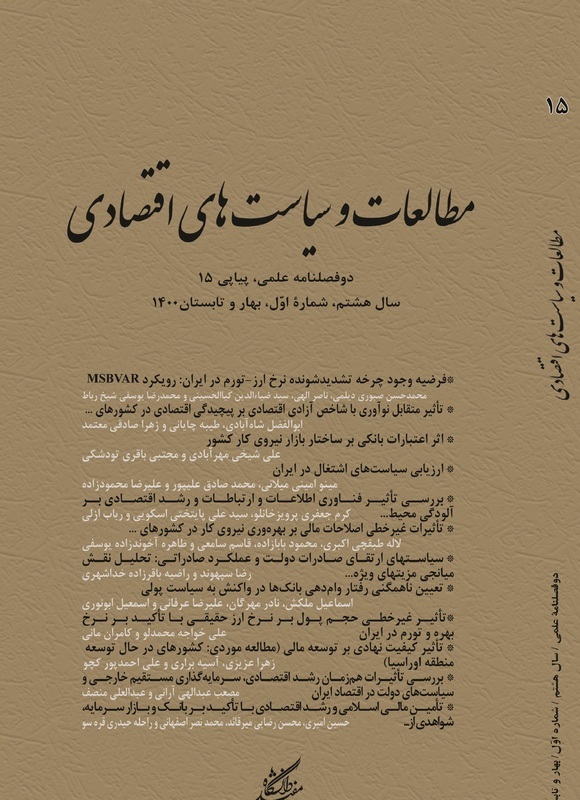 در این مقاله یک تابع تقاضای پول برای بازار پول ایران تعریف و سپس با استفاده از آن به برآورد هزینه‌های رفاهی تورم در دوره (1386-1338) پرداخته می‌شود. در این بررسی ابتدا با استفاده از آزمون ریشه واحد دیکی فولر تعمیم یافته و روش هم‌جمعی یوهانسن به بررسی رابطه بلند‌مدت هزینه فرصت نگهداری پول و نسبت حجم نقدینگی به در آمد پرداخته شده و سپس هزینه رفاهی تورم بر اساس معکوس تابع تقاضای پول و بر مبنای الگوی لگاریتمی لوکاس (2000) و الگوی نیمه لگاریتمی کاگان (1956) تخمین زده شده است. نتایج تخمین نشان می‌دهد که اگر نرخ تورم از 3 درصد به 15 درصد افزایش یابد هزینه رفاهی تورم در مدل لگاریتمی از 14/0 در صد GDP به 7/1 درصد GDP ودر مدل نیمه لگاریتمی از 12/0 درصد GDP به 3/2 درصد GDP افزایش خواهد یافت.با توجه بررسی‌های انجام شده، به نظر می‌رسد که مدل نیمه لگاریتمی جهت محاسبه هزینه رفاهی تورم در ایران مناسب‌تر است. Inflation has negative effects on economic welfare in different ways. In other words, it may cause welfare costs for society. Many studies indicate that there is a positive and statistically significant relationship between monetary policy and inflation, particularly in developing countries including Iran. Estimation of welfare cost of inflation may help policy makers as well as monetary authorities to evaluate the welfare effects of their policies and decide how to proceed. This paper defines a money demand function for Iran's money market, then by applying advanced econometrics techniques and based on Lucas Logarithmic model (2000) and Caygan’s semi log version (1956), the welfare cost of inflation is estimated for the period of 1958-2007. جعفری صمیمی، احمد؛ تقی‌نژاد، عمران؛ هزینه رفاهی تورم: بسط الگوی لوکاس و ارائه دیدگاه جدید،تحقیقات اقتصادی، 1383، شماره 46. BAE, Y, The Money Demand Function and Nonlinear Cointegration, Columbus: Ohio State University, 2005. BAILEY, M. J, The welfare cost of inflationary finance, Journal of Political Economy, 1956, 64:93.110. CAGAN, P, The Monetary Dynamics of Hyperinflation. In Milton Friedman, Ed. Studies in the Quantity Theory of Money, Chicago: University of Chicago Press, 1956. DOTSEY, M. and IRELAND, P. N, The Welfare Cost of Inflation in General Equilibrium, Journal of Monetary Economics, 37, 1996, 29-47. FISCHER, S, Towards an Understanding of the Costs of Inflation: II, Carnegie- Rochester Conference Series on Public Policy, 15, 1981, 5-41. FRIEDMAN, M, Essays in Positive Economics, University of Chicago Press, 1953. FRIEDMAN, M, optimum quantity of money, In the Optimum Quantity of Money and Other essays, Chicago: Aldine Publishing Company, 1969. GUPTA & UWILINGIYE, Measuring the Welfare Cost of Inflation in South Africa, South African Journal of Economics, Vol 76, 2008, No. 1, 16-25. IRELAND, P.N, On welfare cost of inflation and the recent behaviour of Money Demand, Working paper Department of Economics, Boston College, 2007. JOHANSEN, S, Likelihood-based Inference in Cointegrated Vector Autoregressive Models, Oxford: Oxford University Press, 1995. Lucas Robert E. and Stocky Nancy L, Optimal Fiscal and Monetary Policy in An Economy Without Capital, Journal of Monetary Economics, 12, 1983, 4-141. LUCAS, R. E. Jr, Inflation and Welfare, Econometrica, 68, 2000, 74-247. McCallum,B. & Goodfrind M, Demand for Money: Theoretical Studies, The New Palgrave Dictionary, 1987, 775-781. SERLETIS, A. & YAVARI, K, The welfare cost of inflation in Canada and the United States, Economics Letters, 84, 2004, 199-204. TOBIN, J, Inflation and Unemployment in, American Economic Review, Vol 62, 1972, No 15. Turan G, U.S. Money Demand and the Welfare Cost of Inflation in a Currency - Deposit Model, Vol. 52, 2000, 233-258.